N° Yvert : 3816 à 3821. feuillet de 6 timbres. albums neufs 16 – 32 – 48 – 64 pages en noir ou en blanc. N° Yvert bloc 639. albums neufs 16 – 32 – 48 – 64 pages en noir ou en blanc. État TBE ; voir scan. Grenade Grenadines. n° Yvert : bloc 615. albums neufs 16 – 32 – 48 – 64 pages en noir ou en blanc. N° Yvert 4007 à 4012. albums neufs 16 – 32 – 48 – 64 pages en noir ou en blanc. 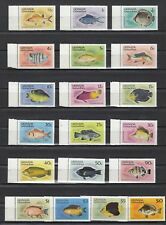 (Grenada 2010 Fish Definitives - Mint Never Hinged (MNH). You will be back for more! 3) Select each item and 'Add to Basket'. (Grenada Carriacou & Petite Martinique (Grenadines of Grenada) 2019 Sharks - Tiger Shark - Mint Never Hinged (MNH). =================================================. 3) Select each item and 'Add to Basket'. (Grenada Carriacou & Petite Martinique (Grenadines of Grenada) 2019 Sharks - Bull Shark - Mint Never Hinged (MNH). =================================================. 3) Select each item and 'Add to Basket'. Grenada Carriacou & Petite Martinique (Grenadines of Grenada) 2016 Crabs of the Caribbeans - Mint Never Hinged (MNH). Sheet with 2 values (2v S/S) ==================================================. (Grenada 2017 Coral Reefs - Mint Never Hinged (MNH). =================================================. 3) Select each item and 'Add to Basket'. Grenada Carriacou & Petite Martinique (Grenadines of Grenada) 2019 Sharks - Mint Never Hinged (MNH). Sheetlet with 4 values (4v M/S). 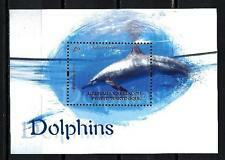 Grenada Carriacou & Petite Martinique (Grenadines of Grenada) 2012 Whales- Mint Never Hinged (MNH). Sheet with 1 value (1v S/S ) Can't see the 'Add to Basket' button?. 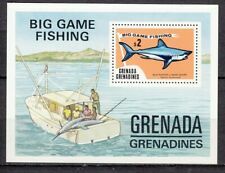 (Grenada 2015 MNH Fish of the Caribbean - Mint Never Hinged (MNH). Sheet with 1 value (1v S/S) 3) Select each item and 'Add to Basket'. (Grenada 2018 Caribbean Fish - Mint Never Hinged (MNH). Sheetlet with 4 values (4v M/S) 3) Select each item and 'Add to Basket'. (Grenada Carriacou & Petite Martinique 2013 Marine Life - Mint Never Hinged (MNH). Sheet with 1 value (1v S/S) 3) Select each item and 'Add to Basket'. The set is dedicated to Caribbean Spiny Lobster Panulirus argus. -:- The item you receive may not be the item scanned, but will be of similar quality. Date of issue: 23 June 2009. No Exclusions. Condition: Mint Never Hinged. 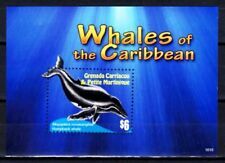 (Grenada 2015 MNH West Indian Manatees - Mint Never Hinged (MNH). Sheet with 1 value (1v S/S) 3) Select each item and 'Add to Basket'. The set is dedicated to Caribbean Spiny Lobster Panulirus argus. Scott No. : 2727. -:- The item you receive may not be the item scanned, but will be of similar quality. No Exclusions. Yvert No. : 3785-3788. Grenada Carriacou & Petite Martinique (Grenadines of Grenada) 2018 Jellyfish - Mint Never Hinged (MNH ). Sheetlet I with 4 values (4v M/S I). 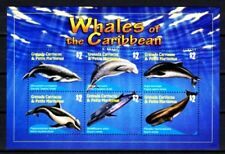 (Grenada 2015 MNH West Indian Manatees - Mint Never Hinged (MNH). Sheetlet with 6 values (6v M/S) 3) Select each item and 'Add to Basket'. (=================================================. 3) Select each item and 'Add to Basket'. No Exclusions. Date of issue: 28 March 2001. You think price is not right?. -:- The item you receive may not be the item scanned, but will be of similar quality. Condition: Mint Never Hinged. Yvert No. : 2931-2934. 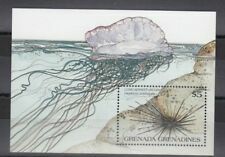 Grenada Carriacou & Petite Martinique (Grenadines of Grenada) 2018 Jellyfish - Mint Never Hinged (MNH ). Sheetlet II with 4 values (4v M/S II). The set is dedicated to Caribbean Spiny Lobster Panulirus argus. No Exclusions. Condition: Mint Never Hinged. Yvert No. : 3785-3788. Scott No. : 2294 a-d. Date of issue: 28 March 2001. No Exclusions. Condition: Mint Never Hinged. Yvert No. : 2931-2934. 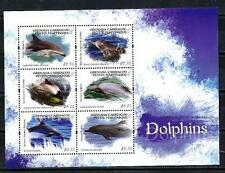 Grenada Carriacou & Petite Martinique (Grenadines of Grenada) 2013 Dolphins - Mint Never Hinged (MNH). Sheetlet with 6 values (6v M/S). Land: Grenada-Grenadinien. ist nicht ausweisbar. (Grenada 2018 Caribbean Fish - Mint Never Hinged (MNH). Sheet with 1 value (1v S/S) 3) Select each item and 'Add to Basket'.